As the frosty days of January settle in, it’s such a comfort to have some warm and soothing soup. 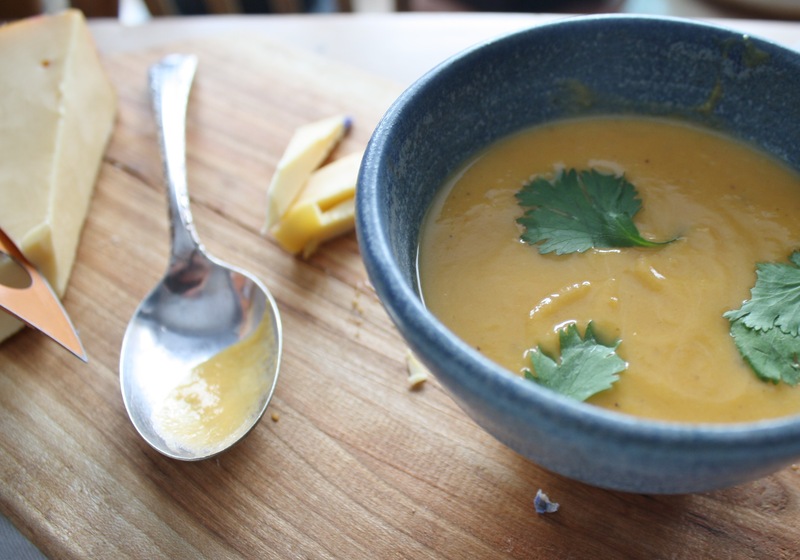 I made a batch of this squash soup and enjoyed it so much. I’m sure it tastes better the second day too. This is an easy recipe and the addition of a bit of orange or apple juice and a grated apple at the end just balance it out perfectly. I added 2 tsp of curry powder when I cooked the onions…for those of you who know me, you know I love me some curry. 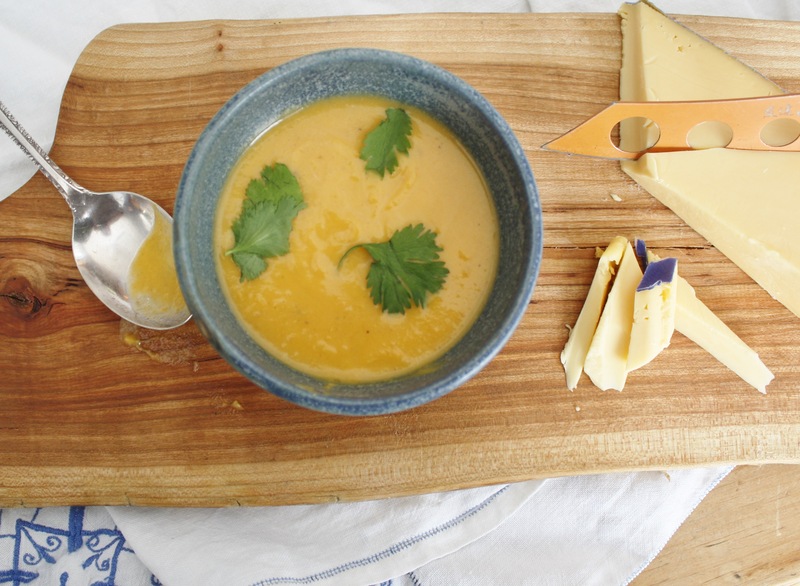 If you love it, add the curry too…but this soup stands up beautifully on it’s own as well. Here’s to keeping cozy. In large saucepan, over medium heat, melt butter. Add onion and cook until softened, about 7-8 minutes. Add garlic and ginger, stir and cook 2 minutes. Add squash and stock. (enough to cover). Increase heat, bring to a boil, then reduce heat to a simmer and cook until squash is tender, about 15 minutes. Using handheld blender, puree soup. Add orange juice or apple cider, and grated apple. Taste and adjust seasoning – salt/pepper. *this soup is also excellent with the addition of curry powder. Stir 2 tsp. in after adding garlic and ginger. Saute onions, garlic, ginger - add squash and stock. Add orange juice or cider and grated apple. I like to use granny smith's. Although many of us dread this time of year with the cold winds and grey skies, one advantage is that we do tend to make and eat a lot more soups. I like to have several containers of homemade chicken stock in my freezer, so when colds and flu strikes, you can quickly alleviate someone’s suffering. The health benefits of real, homemade chicken stock are many, so save all your chicken cuttings and scraps, place in ziplocs in the freezer until you have a couple of pounds of chicken bones, etc. and then cook off some stock – simmer on the stove for about 6 hours, strain and place into containers and freeze. Believe me, when it’s YOU who has the cold, it’s really great. I’ve included a basic chicken soup recipe (for my less experienced readers), although many of you will want to use your own tried and true formula. The dumplings, which are so delicious and comforting are a delight whether you’re sick or not. It’s a basic choux pastry dough, but instead of baking it, you are going to plop it into your soup. Once you make it, you’ll understand why this old-fashioned soup never goes out of style. In large saucepan over medium-high heat, heat oil. Add onion, celery and carrot, and cook, stirring for 5 minutes or so. Reduce heat if it starts to smoke or veggies are browning too quickly. Add poultry seasoning, stir. Add chicken stock and chicken and cook until vegetable mixture is tender – about 15 minutes. Add lemon juice, taste and adjust seasoning. In medium saucepan, bring water, butter and salt to a boil. Remove from heat, and quickly dump in flour and stir vigorously until dough comes away from sides of pot. Transfer to stand mixer bowl. Add eggs, one at a time, incorporating fully, until it has a satiny sheen before adding the next egg. (Eggs can be mixed by hand in the pot, but you will get a really sore arm). When all eggs are incorporated, drop by teaspoonful into simmering chicken soup. Work quickly and drop in all your dumplings, then cover pot. Bring soup to a boil and cook dumplings until they are quite expanded. The lid will probably be lifting off the pot. At that point, turn off your soup and let it cool a bit. Enjoy. So good. I like to add some extra salt to my dumplings when serving. when butter is melted, remove from heat. add eggs, one at a time, mixing well until dough has satiny sheen. dumplings will look like this after they calm down. This is my ‘go to’ soup for comfort and flavour. It has the richness of sweet potatoes and coconut milk, savoury flavour of onions and ginger and is brought to life with fresh lime juice. It’s simplicity adds to it’s awesomeness. It can be served as a appetizer for an elegant dinner party or served for lunch with crusty bread and a salad. Also, whenever my stomach and or digestive system goes crazy, which is often, I make this soup (with homemade chicken stock that I keep in the freezer) and serve it over a little rice. It’s very soothing and yummy. Melt butter in a large saucepot over medium heat and cook onion 3-4 minutes to soften, but not browned. Add sweet potato and ginger and cook for 3-4 minutes. Stir in coconut milk and 3 cups of stock. Simmer 25 minutes, until sweet potatoes are tender. Purée until smooth with a hand blender, add remaining stock if soup is too thick. Stir in lime juice. Return to heat and season to taste. Ladle into bowls and top with coriander leaves and another squeeze of lime juice. Keeps well in the fridge for about 4 days. add chicken stock and coconut milk and cook until potatoes are tender.